When I posted the picture of my truescale terminator the other day, I was asked how I converted his stormbolter. I'd made it look like the older metal ones with two individual gun barrels instead of that one piece blob that's on the front of plastic stormbolters these days. The conversion is quite simple and takes no time at all. The idea came from the post I did a while ago showing how you can repair a gun barrel if you happen to damage it while drilling it out. I figured if I could repair one by making a new one, I could make two new barrels and change the look of the a current stormbolter back to the old school style. Aside from your hobby tools and a stormbolter, you're going to need two different sized rolls of greenstuff. I suspect you could do this with plasticard tubing as well if you went hunting and found the right sizes. One roll needs to be the same thickness as a normal gun barrel and the other roll needs to be much thinner so it can be used as the small stud mounted in between the barrels on top of them. The first step is to carefully cut away the barrels on your existing stormbolter. Be careful not to damage the small, flat mount on the underside of the barrels. One thing to pay particular attention to is the surface of the front of the weapon once you cut the barrels off. You want that to be as smooth and flat as possible. 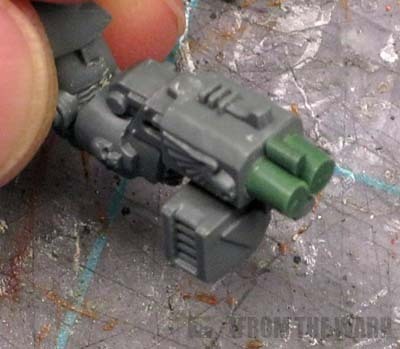 One you have the weapon modified, it's a matter of gluing two new sections of greenstuff rolls in place of where the gun barrels were located. Pay attention when lining them up. You want them to stick out straight from the weapon. 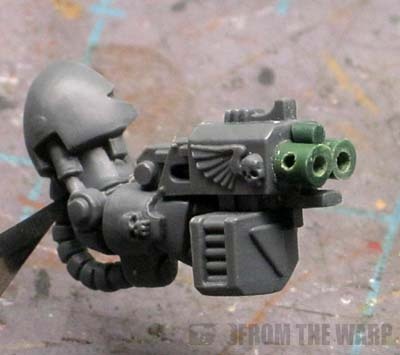 If they're off or they're angled, the effect will not work and the gun will look weird. You don't have to worry too much about them being the same length since you can cut the fronts off once they are glued in place so they match up perfectly. Make sure to cut the muzzles off nice and straight as well. If need be, use a file to get them as close to perfect as you can. The slightest irregularity and they will look "wrong." Once you have both of the new gun barrels in place, you can add the smaller piece on the top in between them. This is just a shorter and smaller diameter piece of greenstuff that is glued down right in between both barrels. 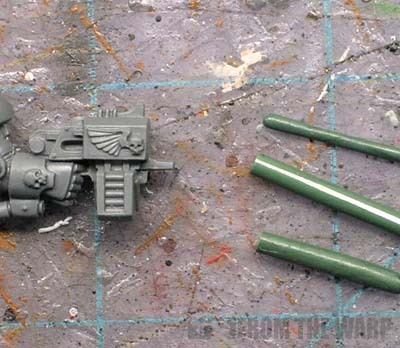 Once everything has had some time to dry, you can drill out your gun barrels. I start with the side holes and then do the fronts. I also expand the front ones slightly to give the gun a more menacing look. The larger muzzle openings indicate a larger caliber weapon to me and that just looks way cooler. The end result is a subtle conversion that can be overlooked quite easily. But it adds additional detail to the weapon and makes it look a little more believable I think. Ron, this is why i love reading your blog. This is the good stuff. Very useful. Like it very much! Ron, the biggest compliment I can give is that I didn't realise it was a conversion! I just assumed it was the original model! Xepher: I never thought to do that. ieuan: Thank you. That's perhaps the best thing someone can say about a conversion. It's odd that it's a compliment if someone doesn't even notice your conversion work and they think it's just the way the model is. thanks a lot for the tutorial. This looks really easy, but in the end it needs some experience, I think. Amonius: Don't let it scare you away. Just take your time and you'll be fine. Worst case scenario... you break off the new barrels and start again. You can't fail. 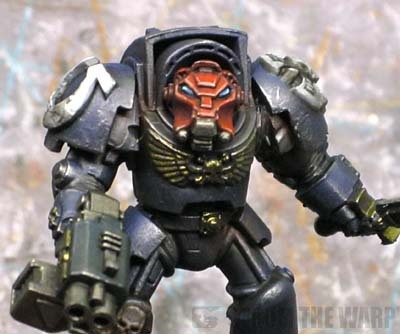 I've always wondered why storm bolters looked slightly queer. Ansu: Thanks. Like I said, it originally came about as a way to fix broken gun barrels. I just expanded it to make all new ones and change the look of the weapon. This is fantastic. I noticed something was unusual about the stormbolter on your terminator the other day but I just assumed you were using a component I wasn't familiar with. I have to ask, though - wouldn't plasticard rod/tube be easier for this? Or quicker, at least. Bog Witch: You are correct, it would be. If you can get just the right size, it would save you from having to drill out the barrels. How did you get the green stuff looking so smoothe and even? D.Shaw: Easy to do. Roll it out into a thin sausage (you'll need two sizes, one for the barrel and one for the smaller stud between them) and let them cure completely. The trick is to do this on a super smooth surface without any texture. Once they cure, you can cut them to fit with an X-Acto blade for the sharp edges. Great conversion. Simple yet effective. Is there any trick to rolling out nice, round, even cylinders of green stuff? I've always found it quite difficult to get even rolls for tubes, cables etc (they usually end up different thicknesses along the length). Andrew: Since my desk is flat and super smooth, I use that and an old CD case. Barring the smooth desk, you could roll out small lengths between two CD cases since the plastic is smooth. And it doesn't have to be 100 percent perfect either. I get areas that are slightly thinner or thicker, I just cut those parts out.